White lupin (Lupinus albus L.) is a legume plant rich in seed protein and appreciated in crop rotation due to improvement of soil structure and fertility. Primitive white lupin accessions are late flowering unless subjected to cold period during seed germination. It is an undesirable trait in spring-based agriculture. Moreover, white lupin is very susceptible to anthracnose, and the only known resistant lines are late-flowering landraces from Ethiopia. Tracking of early flowering during white lupin breeding has been challenging for many years due to the lack of knowledge on underlying genes and limited molecular resources. To address this issue, we performed genomic and genetic analysis of white lupin germplasm differing by time to flowering, including mapping population derived from Kiev Mutant (early flowering, anthracnose susceptible) and P27174 (late flowering, anthracnose resistant). Thirty six flowering induction pathway genes were subjected to molecular marker development and linkage mapping. Markers representing 24 homologs were localized in 17 linkage groups. Four quantitative trait loci (QTLs) of flowering time, consistent across field and greenhouse experiments, were localized in three linkage groups. Three QTLs absolutely co-localized with GIGANTEA, FLOWERING LOCUS T, and SEPALLATA 3 gene–based markers whereas one neighbored the FRIGIDA 3 marker by 3.6 cM. Analysis of narrow-leafed lupin genome regions highly syntenic to these QTLs highlighted these homologs as candidate genes for early flowering. Molecular markers developed in the present study should have facilitated the issue of tracking late-flowering alleles in further white lupin breeding approaches involving primitive Ethiopian germplasm. Sandra Rychel and Michał Książkiewicz contributed equally to this work. The online version of this article ( https://doi.org/10.1007/s11032-019-0952-0) contains supplementary material, which is available to authorized users. Lupins are valuable crops, recognized as a source of protein as well as plants which improve soils and enhance yields of the succeeding sowings in organic farming. Wild accessions of three main Old World lupin crops, i.e., narrow-leafed (Lupinus angustifolius L., L. angustifolius), white (Lupinus albus L., L. albus), and yellow (Lupinus luteus L., L. luteus) lupins, require a period of approximately 3 weeks with low temperature (about 5 °C) to promote flowering (Adhikari et al. 2012). This phenomenon, known as vernalization requirement, is an advantageous natural adaptation to harsh climate conditions, but it is undesirable in spring-based agriculture. Identification of thermoneutral germplasm lacking vernalization requirement was a major achievement in L. angustifolius domestication (Gladstones and Hill 1969). Early-flowering dominant genes in this species were named Julius (in Europe) and Ku (in Australia). Their implementation into breeding programs enabled late spring sowing of L. angustifolius in Europe as well as the introduction of this species as a crop into countries with warm climate such as Australia (Boersma et al. 2007; Święcicki and Święcicki 1995). Recent studies revealed that just a single gene from FLOWERING LOCUS T (FT) subclade, named LanFTc1, underlies locus Ku/Julius (Nelson et al. 2017; Taylor et al. 2019). Vernalization requirement is also a common feature of white lupin (Adhikari et al. 2012). With the release of the first early-flowering L. albus cultivar, Ukrainian Kiev Mutant, carrying hypothetical gene brevis, the species became one of the major, high yielding lupin crops grown worldwide (Gladstones et al. 1998). In addition to brevis, other recessive genes carrying early-flowering phenotype (floridus, festinus, and contractus) were described in white lupin germplasm; however, their relation to the Kiev Mutant brevis gene remains unknown (Święcicki 1986). Accessions with considerably reduced time to flowering, including Start (cultivar) and P28283 (French breeding line), were identified in domesticated germplasm (Adhikari et al. 2011, 2013). Crossing of these two accessions with late-flowering lines revealed that early flowering in these lines is controlled by two complementary dominant genes Ef1 and Ef2, different than the brevis gene present in Kiev Mutant and Ultra (Adhikari et al. 2011). White lupin is very susceptible to anthracnose, caused by the pathogenic fungus, Colletotrichum lupini (Bondar) Nirenberg, Feiler & Hagedorn (Nirenberg et al. 2002). This disease appeared to be very devastating for lupin fields in weather patterns optimal for growth and propagation of C. lupini (Gondran et al. 1996). This disease critically hampered agronomic improvement of this species, as all genetic sources of resistance are buried in late-flowering, bitter, and low-yielding Ethiopian landraces (Phan et al. 2007). To facilitate studies on early flowering and anthracnose resistance, a recombinant inbred line (RIL) mapping population derived from the cross between Kiev Mutant (sweet, early flowering, almost thermoneutral, anthracnose susceptible) and Ethiopian landrace P27174 (bitter, late flowering, vernalization responsive, anthracnose resistant) was developed (Adhikari et al. 2009; Phan et al. 2007; Kroc et al. 2017). Phenotyping of this population revealed that early flowering in L. albus is controlled by several quantitative trait loci (QTLs). The presence of three major QTLs, explaining 31–42%, 9–21%, and 7–14% of total flowering time variation, was confirmed by independent experiments in Poland and Australia (Phan et al. 2007; Książkiewicz et al. 2017). The strongest QTL putatively corresponds to the hypothetical brevis gene. Attempts to combine early flowering from Kiev Mutant with anthracnose resistance from P27174 were unsuccessful due to low frequency of early flowering lines in the progeny and the lack of markers for molecular selection (Adhikari et al. 2009, 2013). Although the positions of the trait loci on the linkage map of this species have been resolved, the genes underlying these loci have so far remained undiscovered (Croxford et al. 2008; Phan et al. 2007; Vipin et al. 2013; Książkiewicz et al. 2017). Moreover, molecular tracking of early-flowering alleles has not been possible due to the lack of gene-based markers. To address this issue, we performed genomic and genetic analysis of white lupin germplasm differing by time to flowering. Transcriptomes of early and late-flowering lines were mined to identify polymorphic loci in L. albus homologs of flowering time control and vernalization response genes. Comparative mapping to the genome sequence of the sister crop species, L. angustifolius, was performed to find which homologs are located in flowering time QTLs. Based on these results, molecular markers anchored in recognized coding sequences were developed and localized on the linkage map. Putative involvement of candidate genes in flowering time regulation is discussed. Genetic mapping was performed using the reference L. albus Kiev Mutant × P27174 recombinant inbred line (RIL) population (F8, n = 196), delivered by the Department of Agriculture and Food Western Australia. This population was derived from a cross between a late-flowering, vernalization-responsive Ethiopian landrace, P27174, and an early-flowering, domesticated Ukrainian line, Kiev Mutant, having reduced vernalization requirement (Phan et al. 2007; Vipin et al. 2013; Książkiewicz et al. 2017). Eleven L. albus lines were assessed for vernalization responsiveness: Kiev Mutant, FRA6713B, Population 775, BGRC 3911, Al.-26, Population 8032, Population 199, P27174, R-114, Mutant softseed, and Population B-267/79. L. albus lines were derived from the European Lupin Gene Resources Database maintained by Poznan Plant Breeding Ltd. station located in Wiatrowo (Supplementary Table 1). L. albus lines were surveyed for time to flowering and vernalization responsiveness in 2015 and 2018. Vernalization was carried out before sowing, by placing imbibed seeds for 21 days at 5 °C in darkness on moist filter paper in Petri dishes. Control plants were sown 4 days before the end of vernalization procedure and grown at temperature ~ 18 °C (~ 10 °C above vernalization threshold) to maintain a similar thermal time (Huyghe 1991). Both treatments were grown in glasshouse conditions at the Institute of Plant Genetics of the Polish Academy of Sciences (Poznan, Poland; 52° 26′ N, 16° 54′ E) under ambient long-day photoperiod (14–16 h) for 110 days. Time to flowering was recorded when the first fully opened flower was observed on a plant. Based on the literature data, the set of 80 gene sequences (including duplicates) evidenced to be involved in flowering time control in Arabidopsis thaliana (L.) Heynh., Glycine max (L.) Merr., and L. angustifolius (Książkiewicz et al. 2016; Nelson et al. 2017) has been selected. Sequences of genes were subjected to sequence homology searches against transcriptome sequences of parental lines of L. albus mapping population (Książkiewicz et al. 2017) as well as the reference transcriptome of L. albus roots and leaves (http://comparative-legumes.org, gene index LAGI01) (O’Rourke et al. 2013). BLASTn algorithm (Altschul et al. 1990) implemented in Geneious v8.1 (Kearse et al. 2012) was used with the following parameters: maximum e-value, 1e-20, word size, 11; match/mismatch, 2/− 3; gap cost open/extend, 5/2. For every gene, matched sequences were extracted and aligned in Geneious using MAFFT 7.017 (Katoh et al. 2002) with specified parameters: genetic code, standard; algorithm, E-INS-I; scoring matrix, 1PAM/k = 2; gap open penalty, 1.25; offset value, 0. Based on the alignment results, sequences were grouped into particular subclades and realigned. Consensus sequences from every subclade were subjected to protein-based Hidden Markov Model gene prediction in FGENESH+ (Solovyev 2004), using appropriate A. thaliana, G. max, and L. angustifolius protein sequences as references. Consensus sequences were also blasted against the L. angustifolius genome assembly L. angustifolius (Hane et al. 2017) with the following parameters: maximum e-value, 1e-20, word size, 7; match/mismatch, 2/−3; gap cost open/extend, 5/2. For every matched gene region, one L. angustifolius scaffold with the highest score value was selected for further analysis. To map intron/exon boundaries, predicted mRNAs as well as original L. albus RNA-seq assembly sequences were mapped to the corresponding L. angustifolius scaffolds using progressive Mauve algorithm with gapped aligner MUSCLE 3.6 (Darling et al. 2004; Edgar 2004). Mauve alignments consisting of reference flowering gene homologs, L. albus Kiev Mutant, P27174 and LAGI01 transcripts, and L. angustifolius scaffolds were screened for the presence of polymorphic loci. The primers flanking these loci were designed using Primer3Plus (Untergasser et al. 2007) and L. albus cDNA sequences as templates. In case of the lack of recognized polymorphic loci between sequences originating from parental lines of mapping population, primers were anchored in different exons to target one or more introns. Plant DNA isolation was performed using DNeasy Plant Mini Kit (Qiagen, Hilden, Germany). Amplification was performed using DNA isolated from L. albus Kiev Mutant and P27174. If primers yielded single products, amplicons were purified directly from the post-reaction mixtures (QIAquick PCR Purification Kit; Qiagen). When two or more PCR products were obtained in one reaction, the appropriate DNA bands were excised from the gel and extracted (QIAquick Gel Extraction Kit; Qiagen). Purified amplicons were sequenced (ABI PRISM 3130 XL Genetic Analyzer; Applied Biosystems, Hitachi) by the Laboratory of Molecular Biology Techniques, Faculty of Biology, Adam Mickiewicz University (Poznan, Poland). Length polymorphisms were visualized directly by 1% agarose gel electrophoresis. Nucleotide substitution polymorphisms were resolved by the cleaved amplified polymorphic sequence (CAPS) (Konieczny and Ausubel 1993) or derived CAPS (dCAPS) (Neff et al. 1998) approaches. Restriction sites and dCAPS primers were identified using dCAPS Finder 2.0 (Neff et al. 2002). Restriction products were separated by agarose gel electrophoresis, with the agarose concentration (1–3%) adjusted to follow the size of the expected digestion products. The calculation of the chi-square (χ2) for Mendelian segregation in F8 RILs was performed using the following expected segregation ratios: 0.4961 (paternal), 0.4961 (maternal), 0.0078 (heterozygote). Calculation of probability was based on χ2 and 2 degrees of freedom. L. albus mapping data (Phan et al. 2007; Vipin et al. 2013; Książkiewicz et al. 2017) were imported to Map Manager QTXb20 (Manly et al. 2001). New markers were distributed using Kosambi function and P value of 0.05. Linkage groups were drawn using MapChart (Voorrips 2002). Data on flowering time and anthracnose resistance (Książkiewicz et al. 2017) and updated linkage map from this study were used to re-draw QTL loci. Three datasets contained data on time to flowering recorded from experiments without pre-sowing vernalization, namely “nonv_05,” arithmetic mean from field experiments performed in Perth, Western Australia (31° 59′ S, 115° 53′ E) in years 2004 and 2005 (n = 190, day length 10–11 h); “nonv_15,” field experiment performed at Plant Breeding Smolice Ltd. station located in Przebędowo, Poland (52° 35′ N, 17° 01′ E) in 2015 (n = 175, day length 14–16 h); “nonv_16,” greenhouse experiment performed at the Institute of Plant Genetics, Polish Academy of Sciences in Poznań (52° 26′ N, 16° 54′ E) in year 2016 (n = 192, day length 14–16 h). One dataset, “vern_15,” contained values of time to flowering from Przebędowo field experiment with vernalization performed by placing imbibed seeds for 21 days at 5 °C in darkness on moist filter paper in Petri dishes and sowing of vernalized plants 5 days after non-vernalized plants to maintain a similar thermal time (n = 178, day length 14–16 h). To address anthracnose resistance QTLs, a dataset “antr_avg” carrying arithmetic mean of resistance scores from anthracnose resistance screening performed in Perth, Western Australia, in years 2004 and 2005 (n = 191) was used. Different numbers of lines (n) present in these datasets result from different seed availability and plant survival in performed experiments. Composite interval mapping was performed in Windows QTL Cartographer V2.5 (North Carolina State University, Raleigh, USA) using 20 background control markers, window size 10 cM, and walk speed 0.5 cM. Linkage groups and LOD graphs were drawn in MapChart (Voorrips 2002). Permutation test (× 1000) was performed using the same parameters. 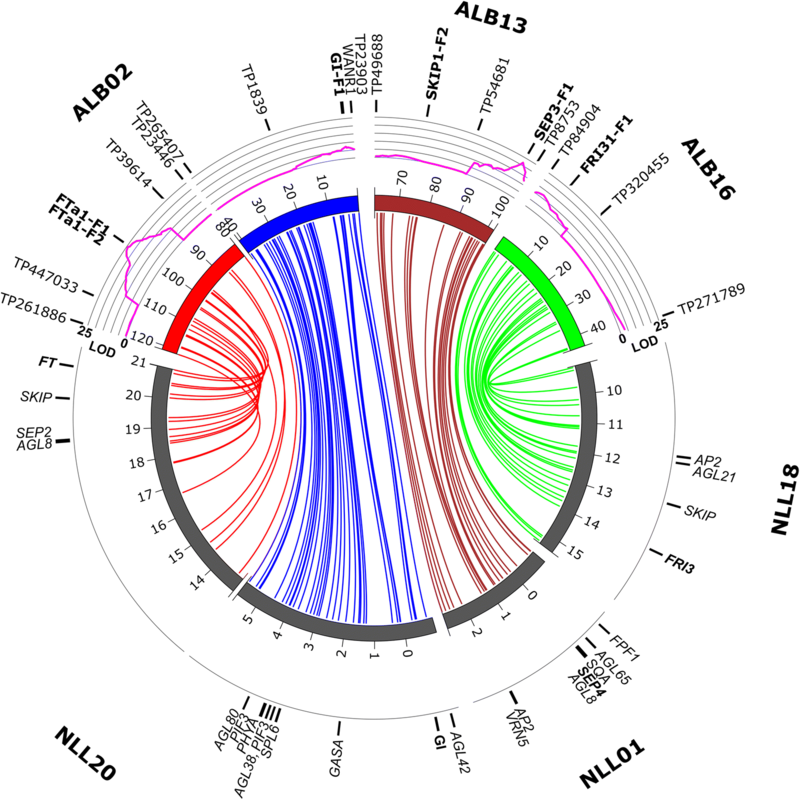 Marker sequences were aligned to white lupin transcriptome assemblies, LAGI01 (O’Rourke et al. 2013), Kiev Mutant, and P27174 (Książkiewicz et al. 2017), allowing one nucleotide mismatch per marker and one lacking nucleotide per alignment. One best hit per marker was selected. A Fasta file carrying marker sequences and assigned transcripts (if applicable) was used for comparative mapping by BLAST (Altschul et al. 1990) to the NLL genome assembly (Hane et al. 2017). Sequence collinearity blocks were visualized using Circos (Krzywinski et al. 2009). The selection of white lupin lines for phenotyping was based on the information on time to flowering in field conditions obtained from the European Lupin Gene Resources Database (Poznan Plant Breeding Ltd., Wiatrowo). Results of both greenhouse vernalization-responsiveness experiments were consistent with those data. Based on the time to flowering in controlled environment without pre-sowing vernalization, plants were divided into three groups, early (Kiev Mutant, FRA6713B, Population-775, and BGRC-3911), intermediate (Al-26, Population-8032, and Population-199), and late (Population-B-267/79, P27174, R-114, Mutant soft-seed) flowering (Table 1). Differences in flowering time between early and intermediate as well as between intermediate and late lines were statistically significant (Student’s t test P value threshold 0.05). Differences in flowering time between accessions within the early and intermediate groups were not statistically significant. Vernalization responsiveness was statistically significant for all lines except FRA6713B which was revealed to be thermoneutral in both experiments. Both trials confirmed that parental lines of mapping population, Kiev Mutant and P27174, significantly differ by flowering time and vernalization requirements. Kiev Mutant was classified in both experiments as an early line with low vernalization response whereas P27174 as a late line, highly responsive to vernalization. Vernalization resulted in advanced flowering by ~ 0 days in the thermoneutral FRA6713B accession, ~ 7 days in early lines, ~ 14 days in intermediate, and ~ 30 days in late lines. To prepare source files for marker development, L. albus transcriptome assemblies were screened with the use of 58 A. thaliana, 13 G. max, and 9 L. angustifolius CDS sequences representing 80 genes or homologs. BLAST mapping, followed by alignments to NCBI RefSeq database of matched transcripts, resulted in the identification of L. albus transcripts for 60 non-redundant genes (Supplementary Table 2). The lacking sequences included, among others, some important flowering time regulators, like FLOWERING LOCUS C (FLC), several AGAMOUS-like (AGL) homologs, EMBRYONIC FLOWER 1 (EMF1), FLOWERING PROMOTING FACTOR 1 (FPF1), one FT homolog (LanFTa2), LIKE HETEROCHROMATIN PROTEIN 1 (LHP1), TWIN SISTER OF FT (TSF), and VERNALIZATION 2 (VRN2). Thirty-six homologs of genes involved in flowering regulation pathways were subjected to more comprehensive assessment. Representative L. albus sequences with the highest score values were used as templates for BLAST screening of Kiev Mutant, P27174, and LAGI01 transcriptome assemblies. The number of identified sequences varied either between genes or genotypes (Supplementary Table 3). EARLY FLOWERING 6 (ELF6), FCA, VERNALIZATION INSENSITIVE 3 (VIN3), FY, and FLAVIN-BINDING KELCH DOMAIN F BOX (FKF) revealed the highest number of transcript variants (20 or more in all three assemblies), whereas FTa1, LEAFY (LFY), BROTHER OF FT AND TFL1 (BFT), FRIGIDA (FRI), VERNALIZATION INDEPENDENCE 3 (VIP3), EARLY FLOWERING 4 (ELF4) the lowest (1 to 3). The total number of transcripts assigned to flowering gene homologs in the reference gene index LAGI01, counting 198, was almost twice as high as those found in Kiev Mutant (116) or P27174 (111). However, some important genes were not recognized in LAGI01 but were identified in early-flowering line Kiev Mutant, namely TERMINAL FLOWER 1 (TFL1), FTa1, and LFY. It may indicate the lack of full vernalization of plants used for transcriptome sequencing (O’Rourke et al. 2013). The same phenomenon was observed for the assembly of late-flowering P27174 line and BFT, FTa1, TFL1, and LFY genes. Based on the multiple nucleotide alignments to corresponding L. angustifolius pseudochromosomes or scaffolds, transcripts were clustered and consensus sequences for protein-based Hidden Markov Model gene prediction were retrieved. The majority of multiplied transcript sequences were just different splicing variants. Therefore, the number of predicted CDS copies varied from one for SEPALLATA 3 (SEP3), BFT, ELF1, ELF3, FTa1, FTc1, FTc2, FRI, FRI3, FLOWERING LOCUS D (FLD), PHYTOCHROME INTERACTING FACTOR 4 (PIF4), VIP3, LFY; to five for ELF6, VIN3, FKF, WD-40 REPEAT-CONTAINING PROTEIN (MSI4), VERNALIZATION 1 (VRN1); and to seven for EARLY IN SHORT DAYS 4 (ESD4). Obtained dataset of transcriptome-derived sequences constituted a platform for molecular marker development. Predicted coding sequences of white lupin homologs of flowering induction pathway genes are provided in Supplementary Table 4. One hundred eighty-one primer pairs were designed to amplify 36 gene homologs. Sequences and characteristics of primers designed for white lupin marker development are provided in Supplementary Table 5. Single band PCR amplicons were obtained for 104 primer pairs (all genes except SOC1 and MSI4). Direct Sanger sequencing revealed that 11 primer pairs amplified two or more PCR products. Marker sequences were deposited in the DNA Data Bank of Japan under accession numbers (LC434127-LC434318) and in Supplementary Table 6. Multiple sequence alignment anchored 75 markers to white lupin predicted CDSs, 91 markers to white lupin transcripts, and 95 markers to narrow-leafed lupin genome. The difference between the numbers of matching CDS, transcript, and genome sequences is an expected outcome because some markers were designed to target introns which are usually not present in the CDS but may occur in the transcriptome assembly. Alignment data for white lupin transcriptome, white lupin CDS, and narrow-leafed lupin genome sequences assigned to white lupin markers are provided in Supplementary Table 7. From the 96 correctly sequenced markers, 60 were monomorphic. Length polymorphism was identified for 6 markers, whereas single nucleotide substitutions (SNPs) for 30 markers. To visualize these SNPs, 22 CAPS and 5 dCAPS markers were developed (Table 2). The summary of white lupin markers developed for flowering induction pathway genes is provided in Supplementary Table 8 whereas the list of all possible restriction enzymes for polymorphism detection in Supplementary Table 9. Markers were mapped in 17 linkage groups with maximum LOD values to adjacent loci in the range from 32.4 to 58.7 (average LOD value of 48.1). These linkage groups included also ALB02, ALB13, and ALB16 carrying four major early-flowering QTLs. RIL segregation data for white lupin non-redundant markers from the most recent linkage map (Książkiewicz et al. 2017) including those developed for flowering induction pathway gene is provided in Supplementary Table 10. Linkage map updated with markers developed in this study has been subjected to QTL mapping based on the flowering time data from two field and one greenhouse experiments without pre-sowing vernalization (datasets nonv_05, nonv_15, nonv_16, respectively) and from one field experiment with vernalization applied (dataset vern_15) (Książkiewicz et al. 2017). Genome-wide permutation test provided the following LOD confidence threshold values (P = 0.005): nonv_05, 4.40; nonv_15, 4.97; vern_15, 4.43; nonv_16, 4.21. In all experiments, several QTLs exceeding P = 0.005 threshold were identified. Corresponding QTL regions from at least two experiments without pre-sowing vernalization were overlapping for 5 loci. Namely, LOD peaks were localized in linkage groups ALB02 at 2.2 cM (2 experiments) and 100.2/100.5 cM (3 experiments), ALB13 at 96.2/99.3 cM (3 experiments), ALB16 at 0.9/2.2 cM (3 experiments), and ALB24 at 0.0/2.1 cM (2 experiments) (Table 3). Three loci (ALB02–100.2/100.5 cM, ALB13–96.2/99.3 cM, and ALB16–0.9/2.2 cM) were supported by LOD values higher than 10 in all three experiments. Three QTLs (ALB02–2.2 cM, ALB02–100.2/100.5 cM, and ALB13–96.2/99.3 cM) were revealed to be absolutely co-localized with GI-F1, FTa1-F1/FTa1-F2, and SEP3-F1 markers, respectively. The QTL at ALB16–0.9/2.2 cM was revealed to be a few centimorgans upstream of FRI31-F1 marker. Such an observation highlighted GIGANTEA, FLOWERING LOCUS T, SEPALLATA 3, and FRIGIDA 3 as candidate genes underlying these QTLs in white lupin (Fig. 1). Moreover, one of the two major anthracnose resistance LOD peaks co-localized to early-flowering LOD peak at ALB02 locus 2.2 cM and GI-F1 marker. The experiment based on vernalized plants revealed the existence of three weak QTLs (LOD values below 10) located in different regions than the QTLs found in experiments with non-vernalized plants. Such an observation is an expected outcome because late-flowering parent is highly vernalization responsive, whereas early-flowering parent is almost thermoneutral. Moreover, this result suggests that the major genes accelerating plant flowering in non-vernalized experiments were those involved in the vernalization pathway. LOD, proportion of phenotypic explained variance, and additive effect values for analyzed white lupin quantitative traits are provided in Supplementary Table 11. To address the putative involvement of other cis-acting factors, synteny-based approach has been adopted. White lupin linkage map was aligned to the narrow-leafed lupin genome assembly, and then, regions highly syntenic to white lupin QTLs were mined for the presence of hypothetical homologs of flowering induction pathway genes (Fig. 2). Results of the alignment are provided in Supplementary Table 12. The first QTL from the white lupin linkage group ALB02 region 0.0–8.6 cM revealed direct collinearity to the narrow-leafed lupin chromosome NLL20 region 0.0–1.38 Mb. Only two potential flowering induction genes were found here, AGAMOUS 42 (AGL42, Lup002088) and GI (Lup002034). Moreover, L. angustifolius GI position matched perfectly L. albus GI-F1 marker and LOD peak locus, whereas AGL42 syntenic locus was found ~ 2.1 cM above the QTL. Other homologs in the proximal chromosome region were as follows: GIBBERELIN REGULATED PROTEIN (GASA, Lup030346), SQUAMOSA PROMOTER BINDING PROTEIN 6 (SPL6, Lup016987), PIF3 (Lup017000 and Lup017026), PHYA (Lup017016), AGL38 (Lup017030), and AGL80 (Lup015610). These genes were located ~ 2–5 Mb or ~ 15–25 cM from the QTL. The second QTL region from the white lupin linkage group ALB02 (96.2–102.6 cM) showed high synteny to the narrow-leafed lupin chromosome NLL20 region 21.1–21.9 Mb. The only known flowering induction regulatory gene localized here was the FT homolog, LanFTa1 (Lup021189). The position of this gene corresponded perfectly to the LOD peak of this QTL and a pair of FTa1-F1/ FTa1-F2 markers. Other genes located in the chromosomal proximity were AGL8 (Lup001398), SEP2 (Lup001397), and SKIP (Lup001577); however, due to high recombination rate in this region, their physical positions in the L. angustifolius genome addressed L. albus linkage map loci localized several centimorgans away from the QTL peak. The QTL region from the white lupin linkage group ALB13 (98.8–100.7 cM) revealed conserved synteny to the narrow-leafed lupin chromosome NLL01 (0.2–1.2 Mb). Several flowering induction regulatory genes have been found here, including FPF1 (Lup018401), AGL65 (Lup018444), SQUAMOSA (SQA, Lup018483), SEP4 (Lup018484), and AGL8 (Lup018485). 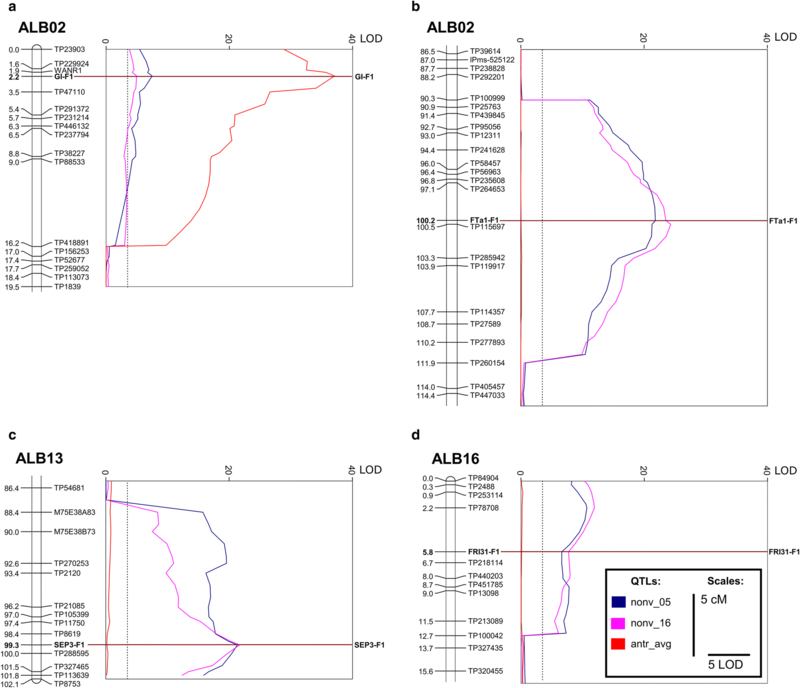 These genes were revealed to form a cluster in the L. angustifolius genome matching directly the position of L. albus SEP3-F1 marker and the QTL peak. Therefore, explicit identification of a gene underlying this QTL requires omics-based approach. Currently, SEP3 is the strongest candidate confirmed by linkage mapping. Some APETALA2 (AP2, Lup009441) and VRN5 (Lup009440) copies were annotated at a 2.8 Mb physical distance but this region had L. albus collinearity landmarks mapped about 25–30 cM away from the QTL peak. The QTL region from the white lupin linkage group ALB16 (0.0–4.7 cM) showed synteny to the narrow-leafed lupin chromosome NLL01 (15.0–16.6 Mb). Only FRI3 (Lup000989) was annotated here as a putative flowering induction regulator. The position of this gene matched the locus FRI31-F1, which is located 3.6 cM away from the LOD peak indicating the possibility of the contribution of different cis-acting factor. However, other genes from flowering regulation pathways found in this chromosome region, namely AP2 (Lup020693), AGL21 (Lup020683), and SKIP (Lup020580), had syntenic loci located as far as ~ 12–20 cM away from the QTL peak. Therefore, the FRI3 gene has been proposed as a candidate gene for this QTL. The QTL region from the white lupin linkage group ALB24 (0.0–2.1 cM) showed synteny to the narrow-leafed lupin chromosome NLL06 (~ 30.1 Mb). The putative homolog of A. thaliana At5g10150, UPSTREAM OF FLC gene, UFC, has been annotated here (Lup011259). Other closely localized genes include MYB transcription factor and histone family proteins. The coordinates of candidate genes found in the narrow-leafed lupin genome regions syntenic to white lupin QTLs of flowering time are provided in Supplementary Table 13. Polymorphic marker data and matching white lupin transcriptome and narrow-leafed lupin protein sequences are provided in Supplementary Table 14. Accurate timing of flowering is crucial for the reproductive success of a plant. Triggering of inflorescence meristem requires gathering information from several pathways related to aging, photoperiod, and vernalization (Baurle and Dean 2006). Moreover, flowering can be also initiated in non-inductive conditions via gibberellin pathway (Khan et al. 2014). Numerous cross-talks between pathways exist, enabling multilateral control of flowering induction in response to various environmental cues (Pose et al. 2012). In the present study, we analyzed more than 70 homologs of flowering induction genes, including all major regulatory pathways. One of the most important abiotic factors affecting floral transition is photoperiod. Key elements responsible for light detection in plants are phytochromes (PHYA to PHYE) and cryptochromes (CRY1 and CRY2), sensing red/far-red and blue wavelengths, respectively (Toth et al. 2001). Light signal is later transduced via circadian clock–controlled pathway comprising the genes GIGANTEA (GI), CONSTANS (CO), and FLOWERING LOCUS T (FT) (Mizoguchi et al. 2005). FT protein works as a long distance mediator, targeting, with the meristem-specific bZIP transcription factor FD, floral meristem identity genes, such as APETALA1 (AP1), LEAFY (LFY), FRUITFUL (FUL), CAULIFLOWER (CAL), and SEPALLATA (SEP) (Pose et al. 2012). CO protein activates FT expression directly binding to CO-responsive elements (CORE1 and CORE2) (Adrian et al. 2010). Long-day detection is based on tight balance between local maximum of CO gene expression in late afternoon, CO protein liability in darkness, and CO stabilization by FLAVIN-BINDING KELCH REPEAT F-BOX 1 (FKF1) (Song et al. 2012; Valverde et al. 2004). Transition from vegetative to generative phase may require prolonged exposition to low temperatures, a phenomenon known as vernalization. In Arabidopsis, vernalization response is based on two dominant genes, FRIGIDA (FRI) and FLOWERING LOCUS C (FLC) (Michaels and Amasino 1999). FLC is a MADS-box transcription factor acting as floral repressor by blocking transcriptional activation via interacting with CArG sequences of FT and SUPPRESSOR OF OVEREXPRESSION OF CONSTANS 1 (SOC1) (Helliwell et al. 2006). FRI also suppress flowering, by increasing the expression level of FLC, as well as through other mechanisms (Michaels and Amasino 2001). However, FLC clade appears to be lacking in galegoid legumes, including lupins (Weller and Ortega 2015; Hane et al. 2017). Flowering induction is also regulated by autonomous pathway. Genes involved in this mechanism were discovered by studies of late-flowering, photoperiod-independent, vernalization-responsive mutants (Khan et al. 2014). Numerous genes contributing to autonomous pathway were identified, including LUMINIDEPENDENS (LD), FLOWERING CONTROL LOCUS A (FCA), FLOWERING LOCUS D (FLD), FLOWERING LOCUS K (FLK), FLOWERING PROTEIN A (FPA), FY, FVE, and RELATIVE OF EARLY FLOWERING 6 (REF6) (Simpson 2004; Noh et al. 2004). Two major mechanisms are harnessed in autonomous pathway of flowering control: RNA regulatory processes, carried by FCA, FPA, FY, and FLK, or chromatin modification state regulation, related to LD, FVE, FLD, and REF6 (Noh et al. 2004; He 2012; Simpson 2004; Kim and Sung 2014). Gibberellic acid (GA), a plant hormone stimulating plant growth and development, also promotes flowering in model plants. Indeed, mutations in gibberellin-responsive genes influence juvenile-to-adult phase transition and flowering induction. These genes include BOTRYTIS SUSCEPTIBLE1 INTERACTOR (BOI), BOI-RELATED GENE1 (BRG1), BRG2, BRG3, SPINDLY (SPY), SOC1, and AGAMOUS LIKE 24 (AGL24) (Moon et al. 2003; Park et al. 2013; Jacobsen et al. 1996). The key control point where numerous pathways converge is the transcriptional regulation of FT gene (Liu et al. 2014). FT is a member of phosphatidylethanolamine-binding protein (PEBP) family, an ancient group of proteins (Hengst et al. 2001; Banfield et al. 1998). In plants, four subfamilies of PEBP were revealed: FT-like, BFT-like, TFL1-like, and MOTHER OF FT AND TFL1 (MFT)-like (Danilevskaya et al. 2008). Whole genome duplications considerably contributed to the expansion of PEBP family in legumes, resulting in a relatively high number of retained homologs, especially in FT-like and TFL1-like subclades (Książkiewicz et al. 2016). Therefore, FT-like genes were grouped into three subclades FTa, FTb, and FTc in legumes. FT promoter and introns contain elements that alter FT expression in response to photoperiod and vernalization, and consequently, induce flowering (Andres and Coupland 2012). The present study provided the FTa1 homolog as a candidate gene for one of the two most important QTLs of early flowering in white lupin (linkage group ALB02, locus 100.2 cM), whereas in the sister lupin crop species, narrow-leafed lupin, this trait is conferred by the FTc1 homolog (Nelson et al. 2017). Such an observation is not unexpected, as the involvement of FTa1 gene in flowering time regulation is a common phenomenon in legumes. In M. truncatula L., FTa1 gene confers vernalization responsiveness and early flowering, whereas FTb contributes to the photoperiod pathway (Laurie et al. 2011; Hecht et al. 2011). In G. max, a vernalization-independent species, three genes classified as FTa and FTc maintain the photoperiod response (Kong et al. 2010; Hecht et al. 2011; Laurie et al. 2011; Takeshima et al. 2016). In pea, FT genes have distinctly different expression patterns across plant development stages, tissue specificity, and response to photoperiod. FTa1 gene corresponds to the pea GIGAS locus, which is essential for flowering under long-day conditions and promotes flowering under short-day conditions (Hecht et al. 2011). All these findings support the hypothesis on the contribution of the FTa1 homolog to early-flowering phenotype in white lupin. GI homolog was identified here as a putative gene underlying early-flowering QTL in white lupin located in linkage group ALB02 at 2.2 cM locus. Study involving a model plant A. thaliana highlighted that GI participates in circadian clock regulation and long day–induced flowering (Kim et al. 2012). Similar functions were also revealed for this gene in pea (Hecht et al. 2007). GI was also evidenced by map-based cloning strategy to be a gene underlying e2 early-flowering genotype in soybean (Watanabe et al. 2011). Our research revealed also co-localization of GI-F1 marker and a major anthracnose resistance QTL in white lupin. This result may indicate that GI gene has multiple roles in white lupin. Recently confirmed functions included escape-based drought tolerance and increased susceptibility to pathogenic fungi (Lyons et al. 2015; LaFlamme 2015). Combining of early flowering with anthracnose resistance in white lupin was fairly ineffective when a Kiev Mutant was used as an early-flowering donor; however, it was much more productive when a different source of early flowering was used (Adhikari et al. 2009; Adhikari et al. 2013). These observations justify the concept on the parallel contribution of white lupin GI homolog to early flowering and anthracnose susceptibility. SEP3-F1 marker was found to co-localize with the most influential early-flowering QTL in white lupin, located at ALB13. However, in the region of the narrow-leafed lupin genome highly syntenic to this locus, a cluster of several flowering induction regulatory genes has been found, including FPF1, SQA, SEP4, and AGL8. FPF1 has not been found in the transcriptome of vernalized P27174 and Kiev Mutant lines; therefore, it is putatively not involved in the flowering initiation process. However, other genes were present in the RNA-seq assemblies and may contribute to this trait. The resolution of linkage mapping is too low to make firm conclusions on SEP3 homolog contribution to white lupin early-flowering trait. FRI3-F1 marker has been mapped in a locus adjacent to the early-flowering QTL peak in white lupin linkage group ALB16, at a distance of 3.6 cM. Despite the lack of any other marker separating these two loci, observed decrease of LOD calculated for the QTL indicates the hypothetical involvement of other cis-acting gene. However, only FRI homolog was found in the syntenic region of the narrow-leafed lupin assembly as a putative flowering induction regulatory gene. As the whole FLC clade is lacking, FRI genes may be considered as major vernalization pathway compounds in lupins. Indeed, allelic variation of FRI accounts for approximately 70% of flowering time variation in A. thaliana germplasm collection (Shindo et al. 2005). Moreover, modulation of flowering time in A. thaliana in response to vernalization is maintained by proteasome-mediated degradation of FRI protein (Hu et al. 2014). UFC gene is the major candidate for the early-flowering QTL locus in white lupin linkage group ALB24. In Arabidopsis, the repression of UFC by vernalization pathway occurs independently of the endogenous FLC gene and does not involve VIN3 and VRN2 components of a PRC2-like complex required for FLC repression (Sheldon et al. 2009). Hypothetical involvement of white lupin homologs of GI, FTa1, SEP3, FRI3, and UFC genes in early flowering and vernalization responsiveness could be evidenced by transcriptome-based study involving P27174, Kiev Mutant, and selected RILs differing by time to flowering. However, such research has been hampered by very limited germplasm resources and high vernalization requirement of Ethiopian parent. Recently, attempts have been undertaken to multiply seeds of RIL population by 21-day vernalization (5 °C) and subsequent plant cultivation for 8 months in control environment chamber with 16 h photoperiod and temperature regime of 18–22 °C. For some late-flowering RILs and P27174, negligible seed yields were observed, indicating the need of longer vernalization period to ensure full flowering. The study reinforced the need of the introduction of untapped early-flowering accessions to breeding programs. 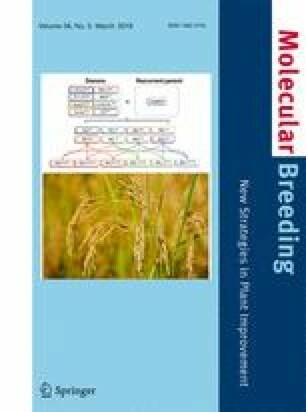 Such landraces with higher yielding ability than current cultivars are available in world germplasm collection for further exploitation (Annicchiarico et al. 2010). Some landraces were also shown to out-yield domesticated germplasm under drought stress conditions due to escape by advanced flowering (Annicchiarico et al. 2018). There is also a considerable number of Ethiopian white lupin accessions to be harnessed by breeders; however, their genetic diversity is limited (Raman et al. 2014). Thus, a core collection of 34 lines represent ~ 100% of molecular marker diversity found in 212 Ethiopian germplasm accessions (Atnaf et al. 2017). It was well evidenced for the sister crop species, narrow-leafed lupin, that domestication bottlenecks considerably limited genetic diversity and constrained adaptation of Australian improved germplasm to diverse environmental conditions, including vernalization requirement (Berger et al. 2012). To address this issue, a model for incorporating novel narrow-leafed lupin alleles from primary gene pool into elite breeding programs while reselecting major domestication genes was established (Cowling et al. 2009). However, due to different control of early flowering and anthracnose resistance in L. albus compared with L. angustifolius, in the form of different number of genes involved (several QTLs vs single genes) and different inheritance patterns (recessive vs dominant), this model cannot be directly translated to white lupin (Książkiewicz et al. 2017). Molecular markers targeting candidate genes developed in the present study should have facilitated the issue of tracking late-flowering alleles in further white lupin breeding approaches involving primitive Ethiopian germplasm. We thank the Department of Agriculture and Food of Western Australia (Perth, Australia) for the seeds of Kiev Mutant × P27174 mapping population. We thank Poznan Plant Breeding Ltd. station located in Wiatrowo for the seeds of white lupin lines for vernalization assay. We also thank Dr. Matthew Nelson for pre-publication access to the white lupin transcriptome data (SRX2663946 and SRX2663947). SR performed transcriptome and genome sequence alignments, designed molecular markers and confirmed them by direct sequencing, isolated DNA from mapping population, and performed all laboratory work required to obtain marker segregation data. MK contributed partially to marker design and performed annotation of gene sequences, CDS prediction, comparative mapping, linkage, and QTL mapping as well as prepared figures and drafted a manuscript. MT performed the assay of white lupin vernalization responsiveness in controlled environment. WB handled submission of marker sequences. BW contributed to the concept of the study and experiment design. The study obtained financial support from Polish Ministry of Agriculture and Rural Development under Task No. 39 of Basic Research for Biological Progress in Crop Production program.